"What a fun book! Having covered thousands of baseball games for the Indianapolis Indians, Howard Kellman must have nearly that many stories he could share. 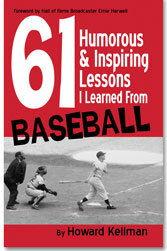 You are certain to enjoy the 61 he has chosen to include in this book." Massachusetts Concrete & Aggregate Producers Assoc. Call or E-Mail Howard to schedule his appearance with your business or organization. Howard will be glad to personally answer your questions and provide all the information you need to help your staff succeed and your event be a hit.